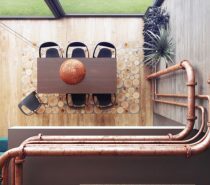 Industrial home decor is a great aesthetic for a home office space. It’s no frills, no fuss approach creates a strong and motivational place in which to get to work. 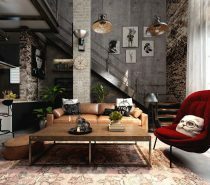 So we decided to take a closer look at what kind of elements are needed to make up a place like this, and put together this collection of inspirational domestic workspaces that are beautiful in the industrial sense. See how to fashion an industrial style home office using raw brickwork and concrete, rustic upcycled wood furniture, ingenious desks that use repurposed industrial metal and some cool accessories that bring the whole kit and caboodle to life. An Eames Eiffel chair looks great with an industrial style desk, with its reinforced metal framework and raw wood legs. 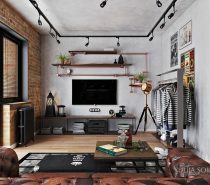 Wood shelving climbs across an exposed brick wall, pausing for surface mounted electrical wiring that just adds to the utilitarian look. Objects of interest are displayed on the shelving to bring personality to the pared back decor, like a dreamy sailboat model and a retro vinyl record. An Eames bird perches next to a chalkboard with a cheerful written reminder to be “happy”. Star Wars patent prints adorn the wall behind this engineers work space, as fun inspiration to reach beyond the stars in imagination and ingenuity. Two small storage units carry safety caution stamps over the drawer fronts to embolden their upcycled appearance. The desk features stunning repurposed metalwork legs. Behind the desk, two rows of wall pegs allow drawing tools to be doubled as decor. This double workspace with integrated shelving system and storage drawers uses pipe shelf brackets to thread the whole thing together with industrial panache. An industrial wall lamp is attached directly to one of the side struts. Slick aviation style melds with rougher edges in this office space to give it a different flavour. Industrial style is surprisingly adaptable and lends itself to many amalgamations. A dominant wall clock on raw concrete, central smart modern desk and cityscape photography gives this contemporary home office an urban city slicker air. The beautiful swivel chair seen here is the Magis Chair One. Neatly rigged electrical wiring patterns a concrete wall in a home music studio. A chunky Embody chair has been set at a small wall hung desk. A vibrant rug matches the look of busy book stacks that cover a concrete wall with colour. Another Magis Chair One is seated at a rustic wall mounted drawer unit, which forms a desktop beneath a higher shelving volume. Black and white photography is arranged in a mini gallery on the whitewashed wall. Colourful typographic prints in simple black picture frames cover the adjacent white brickwork. A bright red industrial style chair throws an unexpected pop of colour into the room. A motivational poster hangs above the workspace, alongside a Frame clock by Nazar Sigaher. Large industrial style lighting pendants not only look great but give generous illumination over an industrial work area. This light features a set of exposed bulbs for a more pared back look. Modern chandeliers add a flash of finesse. Classic works of art soften the edge. A live edge desk and wall shelf introduce a soothing nature feel inside a completely concrete box room. The patina of antique metal and worn leather go hand in hand with industrial style decor. If you crave a the closeness of nature but lack desk space for lots of plants, look at every single other surface as an opportunity for planting. A garden can grow in the most unexpected of places. Petrolheads take note: You can repurpose car tyres to hold up a desktop, or the entire tail of a car to create some cool bespoke seating. Metal panels are bolted together to create new curves for this unique desk. The sloping lines of an Aviator Desk sit well beneath the rise of a staircase. A sharp shiny metal trash can sets off smooth wood tone. 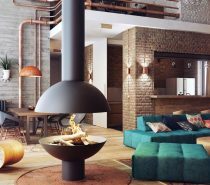 Rustic decor mixed with industrial style makes a warming combination. A floor lamp is a striking alternative to a desk lamp – and saves desk space too. Paint up a massive piece of wood or wall space with some chalkboard paint and use it to scribble notes or motivational quotes. Bring comfort to a utilitarian decor scheme with deep pile rugs and soft furnishings. A black painted brick wall adds depth. Team an Aviator Desk with matching armchairs for a high-end look. Industrial home offices are for kids too. Just one bold hero piece, such as a large wall clock like this industrial style one, can really cement the tone of a room. More subtle pieces can then be positioned around the space, such as industrial shelving brackets or a rustic swing arm wall lamp. 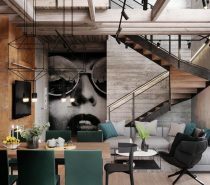 Charcoal decor creates a dramatic backdrop for these double workspaces. Don’t cover up imperfect walls. Find perfection in imperfection. Harness the visually warming effect of woodtone in a cold industrial scheme. Even small pieces create a lift, such as picture frames, storage boxes or a lamp. You can get a similar wooden table lamp to this one here. This industrial table lamp makes a small workspace shine.